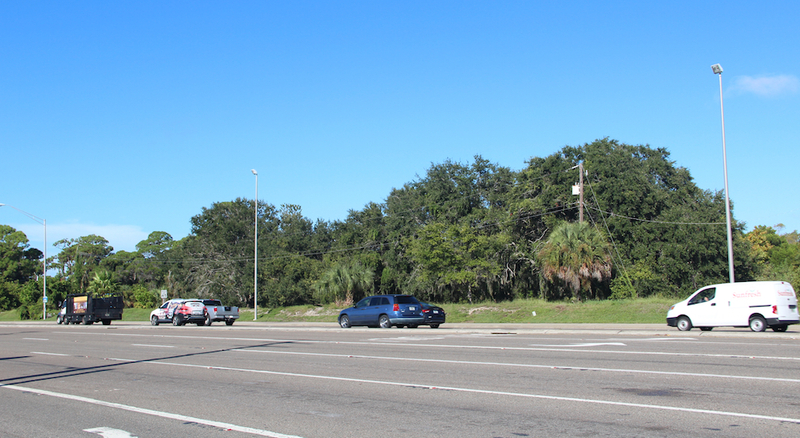 As he prepares to take on the role of chair in 2019, Sarasota County Commissioner Charles Hines has signaled his intention to put the focus on improvements to the intersection of U.S. 41 and Stickney Point Road. 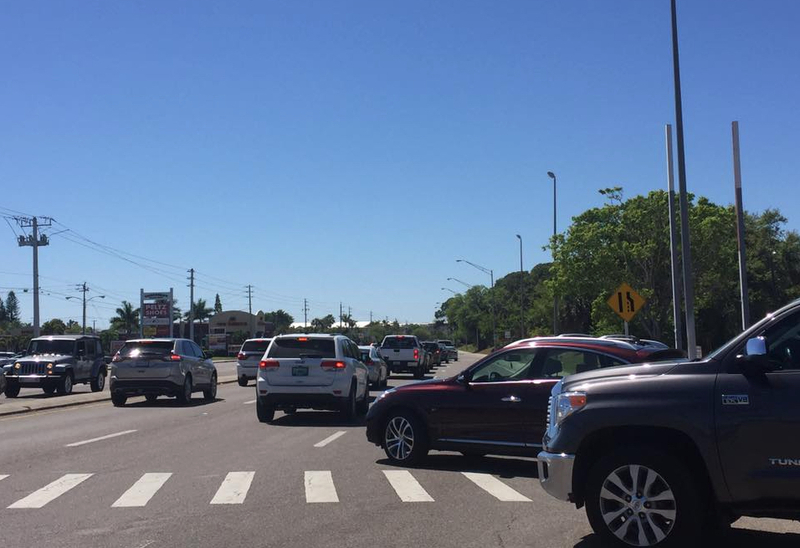 Hines added, “It truly is a public safety problem,” especially because of the fact that the Stickney Point Road drawbridge can open as often as twice an hour and the four lanes on Stickney Point Road drop to two lanes on Midnight Pass Road on Siesta Key. On Dec. 13, the day after the commissioners approved Siesta Promenade on split votes, Hines sent an email to Paula Wiggins, manager of the county’s Transportation Planning Division; County Administrator Jonathan Lewis; and Spencer Anderson, director of the county’s Public Works Department. 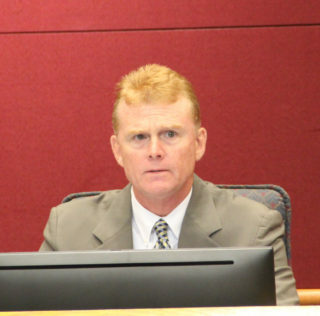 Hines was referring to county staff’s year-long negotiations with the Florida Department of Transportation (FDOT) to transfer county authority over River Road to the state in exchange for the county’s assuming control of roads on Siesta Key. Under state administration, River Road will have a higher priority for widening and other improvements that the county has sought for decades as a state road, FDOT staff has explained. As for the Diverging Diamond: Hines mentioned that major FDOT traffic project during the Siesta Promenade hearing, noting that Benderson Development had worked with the county to push for the construction to decrease congestion at Interstate 75’s interchange with University Parkway. 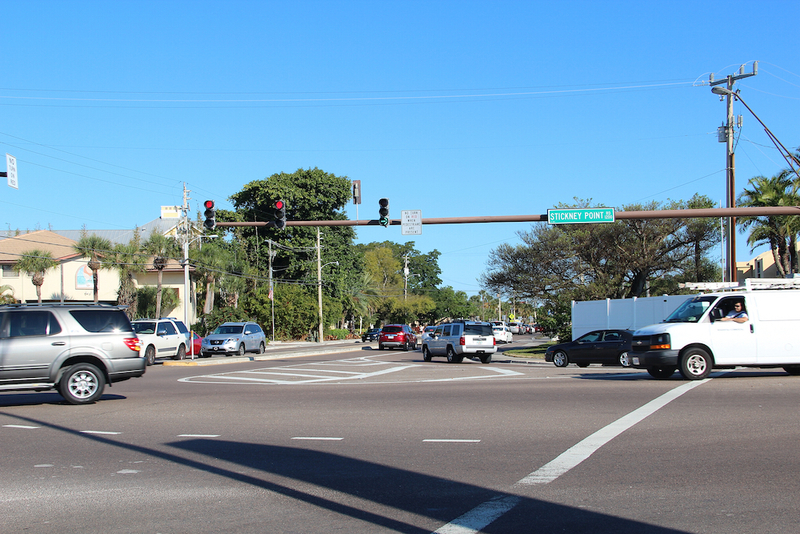 Hines then noted that staff already has planned a commission workshop in 2019 — tentatively in January, County Administrator Lewis said — to discuss further ideas about alleviating traffic congestion on Siesta Key. Among options the board has considered in the past has been implementing a paid parking system at the public beach. “[M]y main idea for potentially supporting that option is to use those funds to directly benefit the Siesta Key Beach area and to have an identifiable long-term funding source for the Siesta Key trolley and to expand its services off the key,” he wrote. 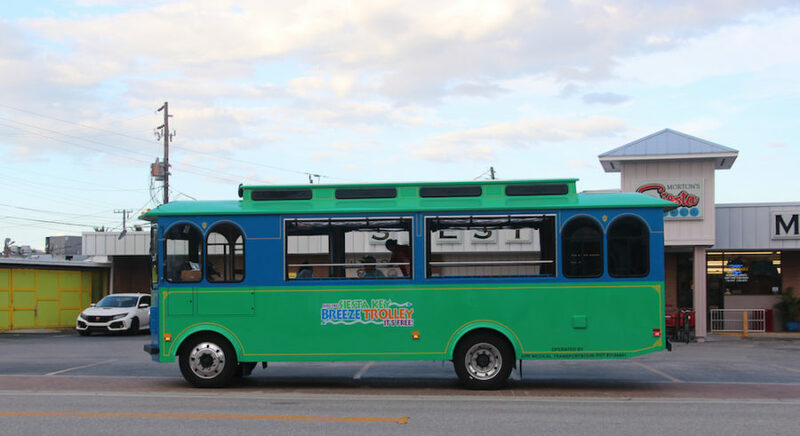 The Siesta Key Breeze open-air trolley, which is free, began circulating between Turtle Beach and Siesta Village in late March 2017. Commissioner Maio, who represents Siesta as part of his District 4 territory, has touted its success. He has pointed out that if a person figures that every two riders on the trolley represent one car not on the island’s roads, then the Breeze accounted for about 125,000 fewer vehicles on Siesta last year. During the Siesta Promenade public hearing, Hines asked a number of questions of Wiggins of Transportation Planning. “Talk to me a little bit about the idea,” he said, that allowing increased density in a Critical Area Plan (CAP) project, such as Siesta Promenade, implies that the community will promote walkability. Hines asked Wiggins to explain to him how people would be expected to walk from Siesta Promenade to the commercial centers on the other three quadrants of the intersection. Hines asked her whether staff discussed with the Benderson project team the need for people to be able to move back and forth between Siesta Promenade and Sarasota Pavilion and Gulf Gate. Crosswalks are in place at the intersection, Wiggins replied. However, as an extra safety measure, she said, “grade separation facilities” would be preferable. Later, she explained that she was referring to constructing one part of the road over the other. “It’s academic, in a way,” Hines told her, “the way land use laws have created this crazy mess of an intersection that actually should shrink,” or have an overpass. “What are we going to do at this intersection?” he asked Wiggins. Has county staff talked with FDOT representatives about an overpass at U.S. 41 and Stickney Point Road, he continued. Perhaps a tunnel is the answer, Hines added. Before he saw one in Fort Lauderdale — which, he stressed, goes under water — he would not have broached such an idea. If the commissioners later that day approved the petitions to make Siesta Promenade possible, Hines asked Wiggins, what will county staff do? 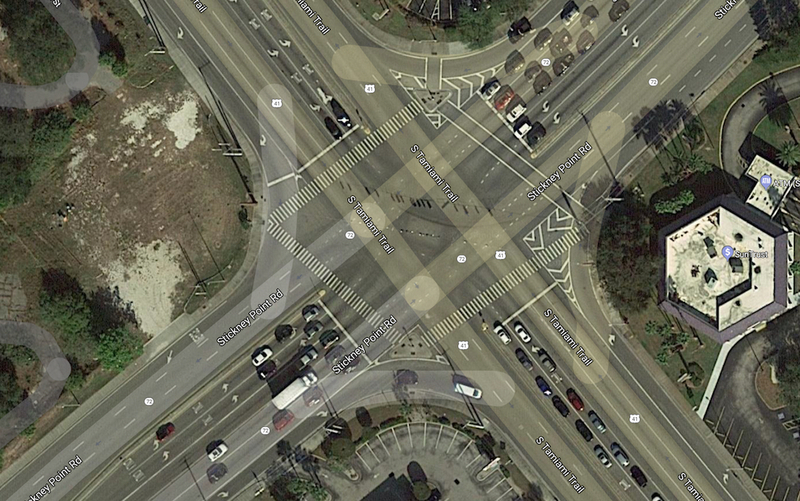 “You can’t just look at the intersection,” she responded. “There’s also the bridge,” she said, referring to the Stickney Point Road drawbridge. “We don’t have control over that,” she added, noting that the bridge is under U.S. Coast Guard authority. “You have to look at all the pieces together,” she told Hines. “It has been discussed internally, if funding was not an issue,” that grade separation would be the solution, she said. She was less certain a tunnel would work in the area, she added, because of the high water table. Perhaps a “road diet” is another option, Hines continued, using a term that refers to decreasing the number of vehicle lanes on a road to increase pedestrian and bicycle access. “You’re telling me that this is just a minor conversation among staff?” Hines asked Wiggins — that staff is not recommending any remedies for such a situation, even though the county’s land use regulations promote mixed-use development and redevelopment in the urban area. “I’m serious about this,” he added. “There definitely needs to be an increase in transit,” Wiggins told him, adding that she also would recommend a pedestrian overpass at U.S. 41 and Stickney Point Road. Many years ago, she pointed out, the leaders of Fort Myers focused on the use of overpasses and other measures to move traffic along quickly, even on a toll road.